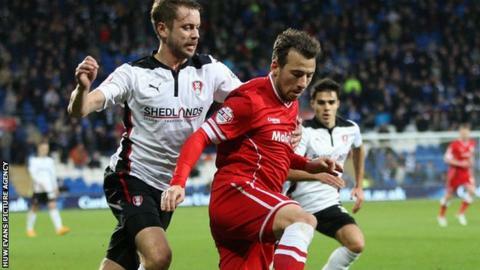 Cardiff City failed to win at home for the first time in six matches after a goalless draw against struggling Rotherham United. Federico Macheda had the Bluebirds' best effort, but his shot was saved by Millers goalkeeper Adam Collin. Adam Revell hit the crossbar with a header for United in a match of few clear-cut chances. Rotherham remain one place above the relegation zone in 21st, while Cardiff drop to ninth. Steve Evans' side have now gone eight matches without a win in the Championship. But their hard-fought point at the Cardiff City Stadium extends the gap between them and 22nd placed Brighton, who lost 3-0 at leaders Derby, to two points. Bluebirds boss Russell Slade, meanwhile, was hoping to exact revenge over the Yorkshire side, who won promotion from League One in the play-off final in May on penalties, when he was in charge of Leyton Orient. The visitors, who have only won once on the road in the league this season, started the brightest with midfielder Richard Smallwood's long-range effort going narrowly wide of the Cardiff goal. Rotherham dominated possession in the first half, but failed to create any real chances of note. Cardiff also struggled to get going and forced their first corner of the half in the 43rd minute. After the break United were first to threaten to break the deadlock, as former Manchester United forward Tom Lawrence cut inside the Cardiff penalty area, but saw his effort well held by goalkeeper David Marshall. Moments later Rotherham's Argentine midfielder Emmanuel Ledesma, on loan from Middlesbrough, went close, striking a free-kick from 25 yards out, narrowly wide of the Bluebirds' upright. Second-half substitute Macheda came on for the largely ineffective Kenwyne Jones and his arrival sparked the liveliest spell of the match as Cardiff pressed forward. Peter Whittingham and Adam Le Fondre had efforts on goal blocked, before Aaron Gunnarsson's pass picked out Italian striker Macheda in the area, but his shot was parried away by Rotherham keeper Collin. The visitors counter-attacked in a breathless passage of play, which ended as Revell headed Smallwood's cross against the Cardiff crossbar. Cardiff manager Russell Slade: "The whole changing room is very disappointed because we got a terrific result last week, trained really well but were below par today. "We deviated from our game plan and what we're good at and it hasn't got us the result that we wanted. "If you look at the bigger picture, it's our third clean sheet in four, however, are we the finished article? Of course we are not." Match ends, Cardiff City 0, Rotherham United 0. Second Half ends, Cardiff City 0, Rotherham United 0. Attempt blocked. Paul Taylor (Rotherham United) left footed shot from outside the box is blocked. Assisted by Richard Smallwood. Offside, Cardiff City. Ben Turner tries a through ball, but Federico Macheda is caught offside. Substitution, Rotherham United. Jonson Clarke-Harris replaces Tom Lawrence. Paul Taylor (Rotherham United) wins a free kick in the defensive half. Foul by Kim Bo-Kyung (Cardiff City). Attempt blocked. Fabio (Cardiff City) right footed shot from outside the box is blocked. Assisted by John Brayford. Attempt blocked. Aron Gunnarsson (Cardiff City) right footed shot from outside the box is blocked. Assisted by Craig Noone with a headed pass. Substitution, Cardiff City. Ravel Morrison replaces Adam Le Fondre. Substitution, Rotherham United. Paul Taylor replaces Ben Pringle. Substitution, Cardiff City. Fabio replaces Matthew Connolly because of an injury. Tom Lawrence (Rotherham United) wins a free kick in the attacking half. Substitution, Rotherham United. Jordan Bowery replaces Emmanuel Ledesma. Alex Revell (Rotherham United) hits the bar with a header from the centre of the box. Assisted by Richard Smallwood with a cross. Attempt blocked. Adam Le Fondre (Cardiff City) left footed shot from the right side of the box is blocked. Assisted by Kim Bo-Kyung. Attempt saved. Federico Macheda (Cardiff City) left footed shot from the left side of the box is saved in the centre of the goal. Assisted by Aron Gunnarsson. Attempt blocked. Peter Whittingham (Cardiff City) right footed shot from outside the box is blocked. Attempt blocked. Adam Le Fondre (Cardiff City) right footed shot from the centre of the box is blocked. Attempt saved. Emmanuel Ledesma (Rotherham United) left footed shot from outside the box is saved in the centre of the goal. Assisted by Alex Revell with a headed pass. Attempt blocked. Alex Revell (Rotherham United) right footed shot from the left side of the box is blocked. Assisted by Tom Lawrence. Offside, Rotherham United. Reece James tries a through ball, but Tom Lawrence is caught offside. Attempt missed. Sean Morrison (Cardiff City) header from the right side of the six yard box is high and wide to the left. Assisted by Aron Gunnarsson. Attempt missed. Aron Gunnarsson (Cardiff City) header from the centre of the box misses to the left. Assisted by Peter Whittingham with a cross following a corner. Corner, Cardiff City. Conceded by Craig Morgan. Offside, Cardiff City. John Brayford tries a through ball, but Adam Le Fondre is caught offside. Ben Turner (Cardiff City) wins a free kick in the defensive half. Attempt missed. Emmanuel Ledesma (Rotherham United) left footed shot from outside the box is close, but misses to the left from a direct free kick.